St. Patty’s day is always such a great excuse to make all sorts of sweet treats and tasty drinks, but when I look for a great recipe to make for this holiday the number of cupcakes, cakes, and brownies overloaded with green sanding sugar, clover cut out sprinkles, green oozy icing—-well it begins to look less like food and more like something you found behind your sink when you were cleaning back there that one year. Green is such a great fun tradition, but sometimes maybe we should leave the green on our shirts and let good food look like…good food. 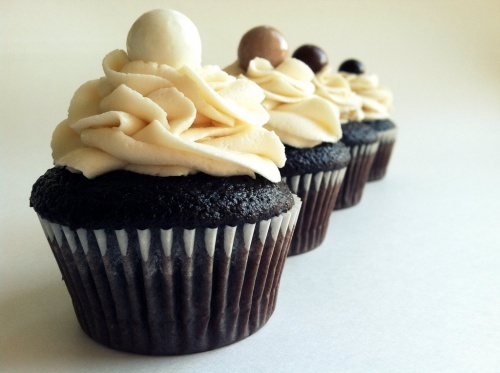 I’ve tried out several “drunken cupcake” recipes over the years and this is the cream of the crop. I combined a few different recipes and found that this is the ultimate crowd pleaser–the ultimate moist, chocolate cupcake (which I WILL figure out how to make un-boozy so i can use it all the time because it is perfect and amazing) with the perfect hint of dark, nutty guiness, the creamy bitterness of the ganache filling, perfectly offsetting the perfectly sweet irish cream buttercream that is the ultimate consistency and flavor. Convinced yet? Make it and find out for yourself how delicious these babies are. And if you can find them, top with these perfect liquor filled chocolates. Zucchini isn’t a big part of our lives. Not purposefully, but somehow it just never comes up and I’m not sure it’s the kind of food you get a craving for. Well, until now. Most meals with the word “stuffed” in it tend to make it on this list—the “hey we haven’t had THAT in a while” list that has often surfaces when we’re in a pinch at 5:45. Starving and confused. A dangerous time to hit the grocery stores, by the way (how did 3 boxes of nutter butters get in our cart??). 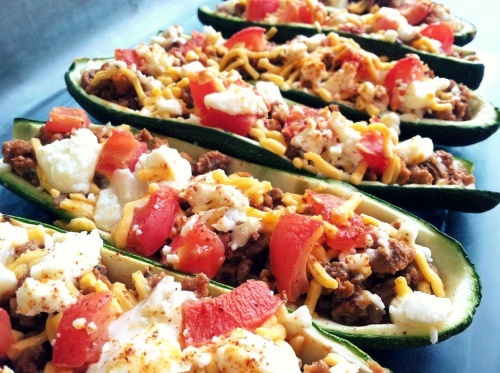 This recipe was as easy as your classic stuffed pepper but with less of a southwestern twist. The flavors are hearty with cumin and a little chili powder lending it a robust flavor that goes great on the zucchini base. The feta and tomatoes add a fresh, light flavor. Pair with some brown or white rice and enjoy a new, healthy and inexpensive meal that packs flavor and will feed your family all week long. I knew i wanted to make this as soon as I saw the picture. I loved the texture–it has a fine crumb and cuts like a dream. The cake is soft and the top crunchy layer is full of brown sugar and cinnamon goodness with a touch of coffee flavor. 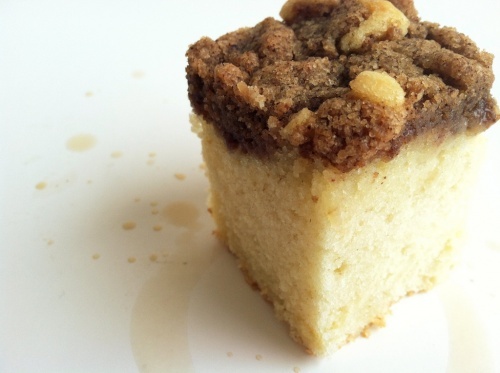 A classic coffee cake, this is definitely going to be my new go-to recipe. I love the gourmet look, tall and perfectly sliced, unlike most recipes which leave you with flat, crumbly heaps of cake. It’s simple to make and would make a great base for your own favorite additions—pecans, blueberries, vanilla bean. Best enjoyed with a warm cup of coffee. Author Kyra KetnickPosted on March 2, 2012 February 1, 2019 Categories breakfast, cakeLeave a comment on happy morning!